With every new hockey season comes a handfull of guys whose cards seem to come out of nowhere and jump to the top of the list of must-haves. In recent memory Sharks defensemen Brent Burns and Erik Karlsson both come to mind, and early in the 2018-19 season, it’s another defenseman who is shooting up to that list: Leafs standout Morgan Rielly. 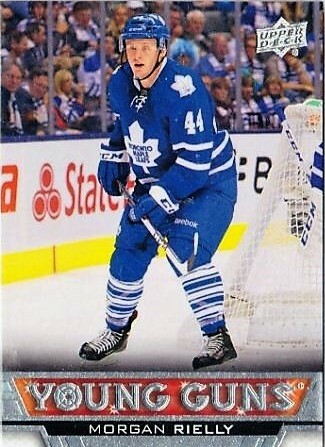 Rielly’s rookie cards can be found in the 2013-14 campaign and that is where you find the majority of the added value for collectors. While names like Tarasenko, Galchenyuk, and Forsberg are household names from that rookie class, it took a little longer for Rielly to get there, but he’s made it now. Currently, he finds himself in the Top 20 in points in the NHL, most of that coming off helpers with just a few goals littered on his stat line. However, his +/- is nothing to be ashamed of and he’s showing the ability to be at the right place at the right time as the Leafs are playing spectacular hockey. All that to say, right now you can still pick up Morgan Rielly rookie cards fairly inexpensively, which may not be a bad idea considering the trend that he is on currently. Here are three cards to grab right now. This is a no-brainer as the SP Authentic brand is a nice mid-end compliment to more expensive offerings like The Cup or Ultimate Collection. With a limited print run of 999 copies, this rookie autograph shouldn’t be difficult to find on the secondary market. Also of note, he has dual Sign of the Times Autograph with fellow defensive standout Seth Jones from this set as well. This card might be the steal of the list as you can find this rookie autograph for less than $30 USD, which is pocket change compared to some of his other cards from Panini, National Treasures and Dominion both come to mind. 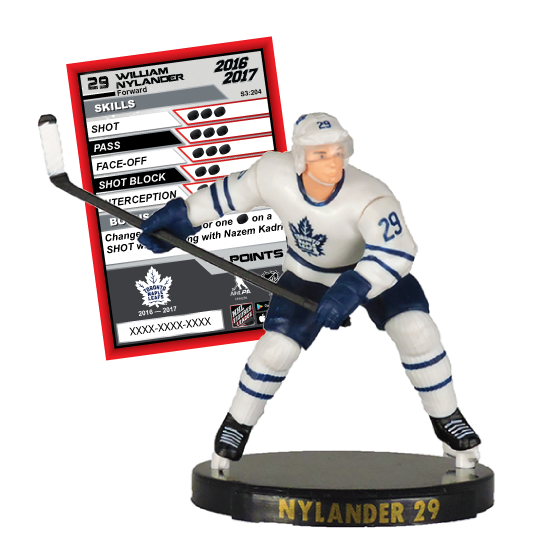 This is an easy grab for Leafs collectors. If the SP Authentic was a no-brainer then this is a shoe-in for a must-have. Rielly doesn’t have a hotter card on the market right now, but rejoice, it’s still affordable. Like the aforementioned Brent Burns, Rielly’s Young Guns has the potential to reach a level of collectability this season that is reserved for the McDavids and Matthews of the world. Granted, a lot of things would have to go right, but given the Leafs fanbase, their history in the league, and the potential for Lord Stanley’s Cup to be brought back to Toronto this season, it’s not out of the question.